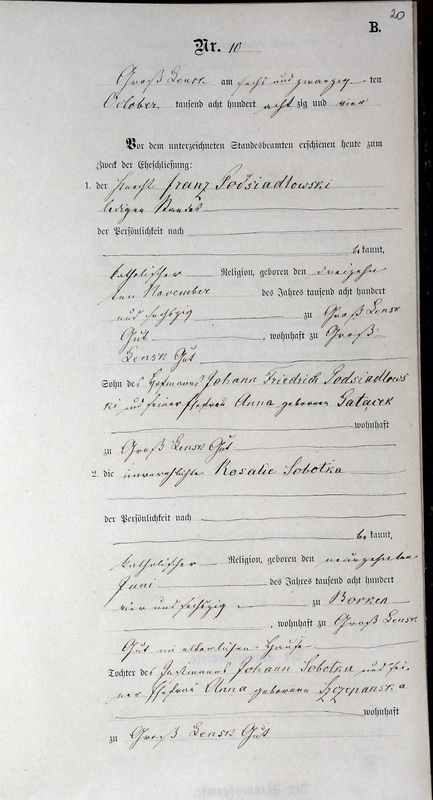 Here is the place where you can upload scan or picture file of your ancestors church record handwritten in German with request of translation it into English. 1. Click on 'postreply' button at the top or the bottom of the page (see attached print screen). 2. Scroll down to the 'Add an Attachment' section. 3. Click 'Browse' or 'Choose your file' button there, find your picture file with record to translate in your local computer disk, and finally click the 'Add Attachment' button. Your file will upload in a few moments and will be visible in your post after you click on 'Submit' button. You can also add a comment to your request for translation in the 'Message body' field above the 'Add an Attachment' section. We have a big request to you please cut and upload only the parts of document you ask to be translated instead of whole large pages. This way you will make our volunteers translators job easier to their tired eyes. They will have larger resolution of the scans and will not have to waste their time for searching the part of the record you are interested in. To edit scan/picture files you can use one of the many desktop softwares (like MS Office Picture Manager or freeware Irfanview http://www.irfanview.com/ ) or free online services (like http://pixlr.com/editor/ or http://www.freeonlinephotoeditor.com/ ). If you want to pay back to translators and pay forward to the whole community see also the announcements: Indexation of Translations and Donations for translations. 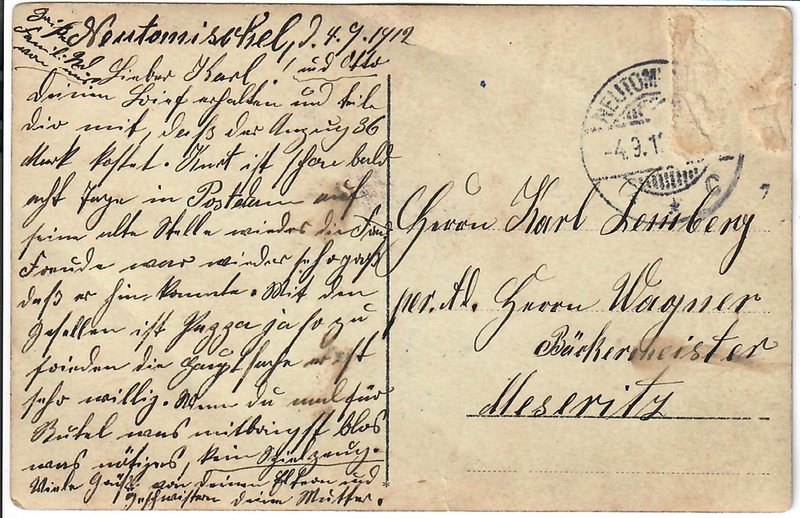 I have an East Prussian 1884 mariiage record for my great uncle-front and back. Also a short blurb from a German book referencing the village of Bonkowo. Following suggestion of one of our member as well as seeing many requests for German translations posted recently and actual translations made especially by Sophia, Elzbieta and Ute, I decided to set the 'German records translations' thread. I hope that this thread will develop as well as the other three: Russian, Polish and Latin translations sections and thanks to assistance of our great experts dozens of us will make progress in our families discoveries . I would like to include these two links that may be helpful. They translate the german words into polish ones. A bit easier, in my opinion. Poland was a very large, multi-languaged country. handled here on P.O. Thank you Zenon for recognizing, adding and nurturing all those various languages. church's and those records may be in German, Russian, Polish or Latin. (I have 'em all). "Old German" which took quite a bit of help to get translated (very much unlike modern German). The SGGEE has an email list with helpful people too . 1. in the column for fathers name is a stamp. I reviewed all the records on this microfilm roll and this is the ONLY entry with a stamp. Does anyone know the significance of this stamp? 2. There are several lines in the remarks column that may explain the stamp and/or shed light on the circumstances of the birth. Can someone please translate this remark? 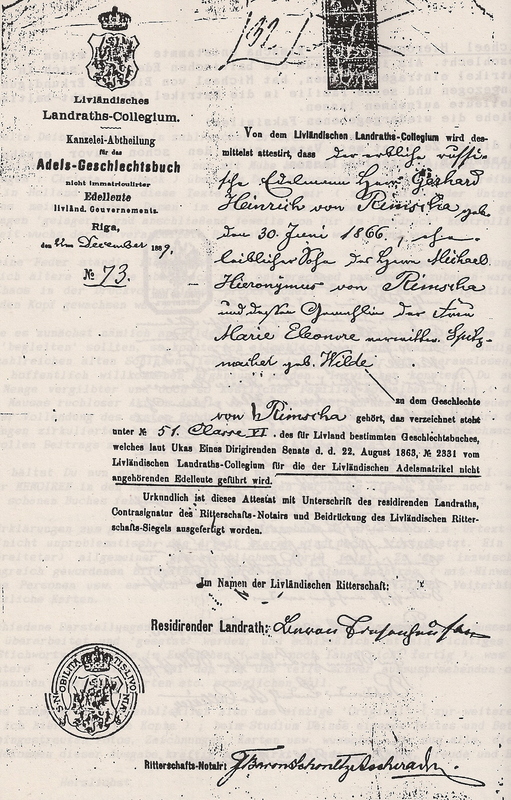 Attachments included for the stamp and remark. 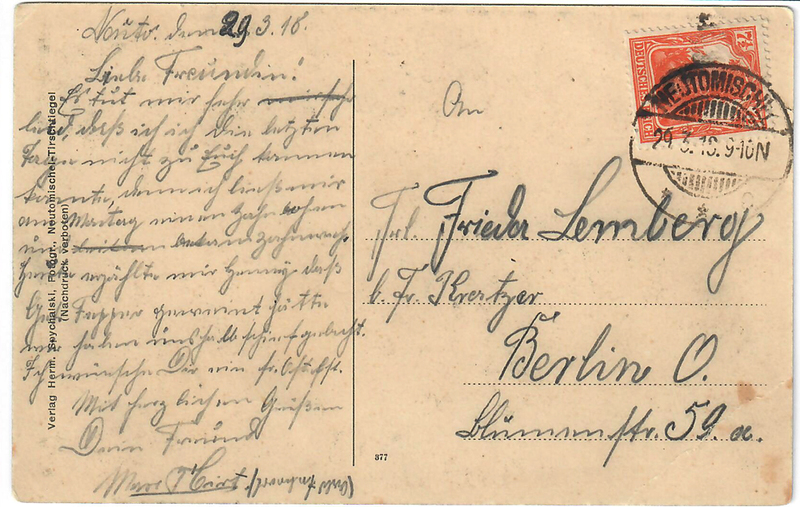 I have 2 postcards handwritten in German in the old style script. 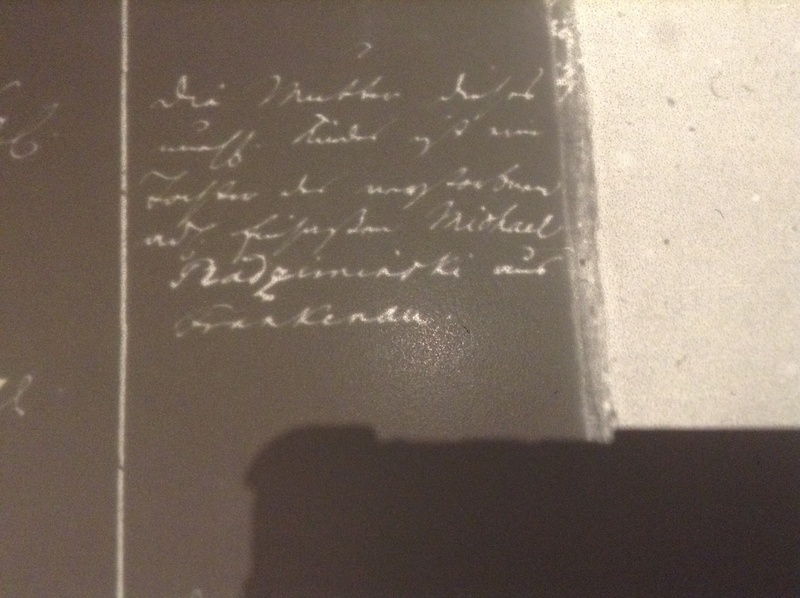 I've tried for years to decipher them, but since I don't know German and am not familiar with the script, it's been impossible for me. I certainly appreciate any help at all. Hi to everyone who has posted here. Zenon, it is a wonderful idea to have all the German translations grouped together. 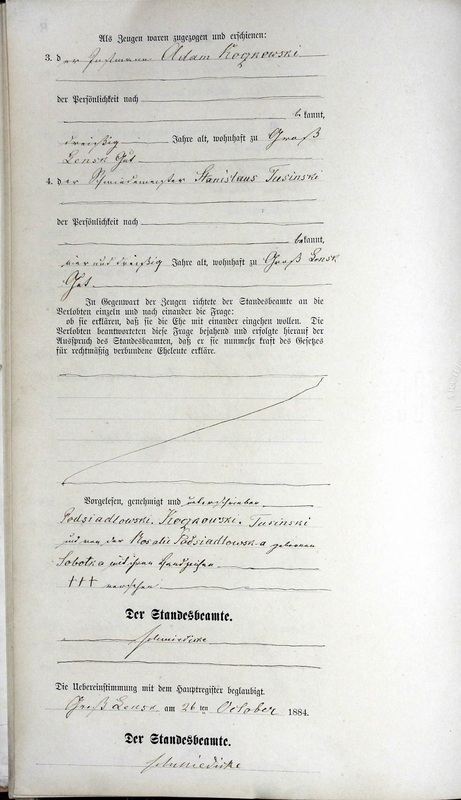 I like your optimism in starting this thread, and I thank you for noticing that I was able to help a few people with some German documents, but I want to make it clear to everyone that my skills are very limited. 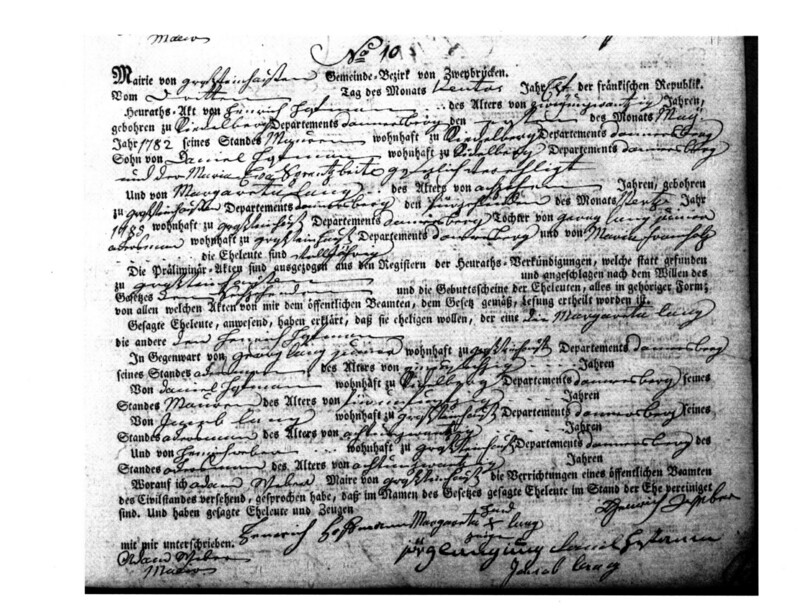 I am not able to read the old German handwriting. I can read the old typeface, and I do have some command of the language but this is no where near the level of expertise that a native speaker of German would have. Gilberto and Bob have provided very useful resources that give the meanings of the column titles for various kinds of genealogical documents, so you already have help with the one thing I was actually able to do. While I may be able to decipher a handwritten word here or there, it is not a very good idea for me to do so on this thread. People posting here will have the expectation that their documents will be translated fully by someone who is certain of what they are reading, and who will do them in the order in which they were posted, as they are done on the Polish, Latin and Russian translations which are handled here on Polish Origins by the most wonderful volunteers. They all work very hard to see exactly what is written - - that is the only way people can confidently move forward in their research. So Nancy, Cynthia and Tracy, I am very sorry that I am not helping you. I would if I could. I do have great hope that someone with the proper German language skills will find this thread and help it grow. Thank you for your reply and your candid disclosure regarding your abilities. I know you would help if you were able to do so. I appreciate the bits of translated words you have given me so far - it definitely got me pointed in the right direction. Would like this translated please. No, I did not learn German overnight, including culture and history of past millennium, but this record from Livonia, today Latvia, one of Baltic Countries, plus my Summer’s discussion with German friends about Hansa, and wonderful cities built by Hansa, including Riga in Latvia, Tallinn in Estonia, Gdansk/Dantzig in Poland, made me curious enough to try to understand what it is, and who is he. Is it your own family record? The nice outcome of genealogy is to learn so many interestings things. More curious: what is Adel? Livländischen Landrath-Collegium // Landrath: rat=council; Livonian Council for Land Properties? zu dem Geschlechte von h. Rimscha gehört, das verzeichnet steht unter N 51 Classe VI des für Livland bestimmten Geschechtsbuches Livländischen Landrath-Collegium nicht angehörenden Edelleute geführt wird. 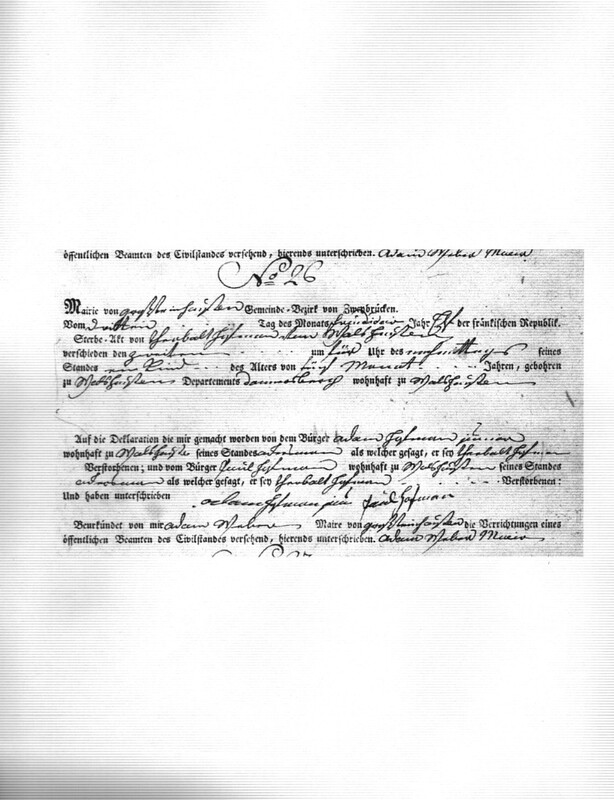 Urkundlich ist dieses Attestat mit Unterschrift des residirenden Landraths, Contrasignatur des Ritterschafts-Notairs und Beidrückung des Livländischen Ritterschafts-Siegels ausgefertigt worden. belongs to the clan of h. Rimscha which is recorded belonging? under N 51 Classe VI of certain of Livonia Livonian Geschechtsbuches Landrath-Collegium nobles is performed. Mentioned this Attestat has been drawn up and signed by the residirenden Landraths, contra signature of Knighthood Notairs and Beidrückung the Livonian knights’ shaft seal. Thank you again for your excellent work. I hope you are feeling better. The answer to your question is yes and no. Yes they are Rymsza's but, I do not believe, they are in my line. 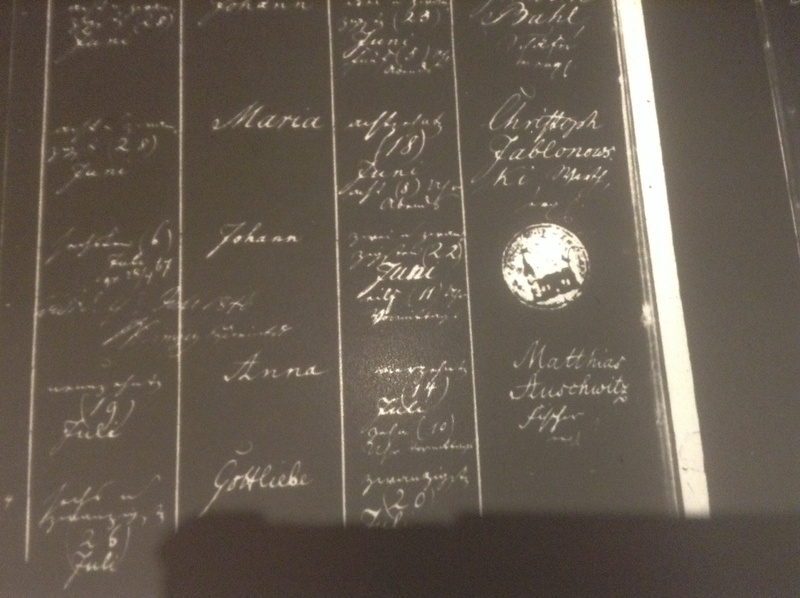 I work very closely with one of their family genealogists and we are always sharing documents. I was provided this early in when I was inquiring about the nobility status of my family. I have always wondered what this document said besides confirming nobility. Here is the second one.